Soft, light florals, luxuriously woven through with sweet spices, soften skin and delight the senses. Handmade with all-natural ingredients, these bath fizzies exude the luxurious benefits from essential oils and unique salts, perfect for deeply conditioning the skin and senses. Contains a curated blend of eight moisturizing oils, including Avocado and Coconut. Luxurious blend of Dendritic, Epsom, French Gray and Himalayan Pink Salts. Deeply moisturizes, nourishes and revives the skin. Fill your bathtub with water (any temperature will do), simply drop in the fizzy, and then lay back and relax while your skin is moisturized and your senses soothed. Add a second fizzy for a super-moisturizing experience. 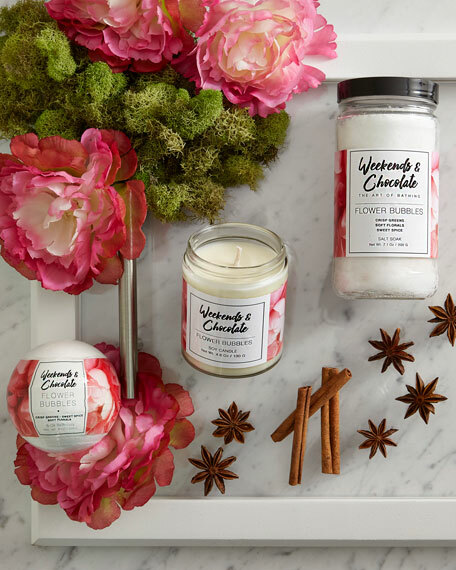 Launching Fall 2017, Weekends & Chocolate is the new modern and sophisticated brand created by successful bath and body entrepreneur Kimberly Mitchell-Barnes. Playful, yet luxurious, the all-new lifestyle line elevates the in-home spa experience, truly defining The Art of Bathing. 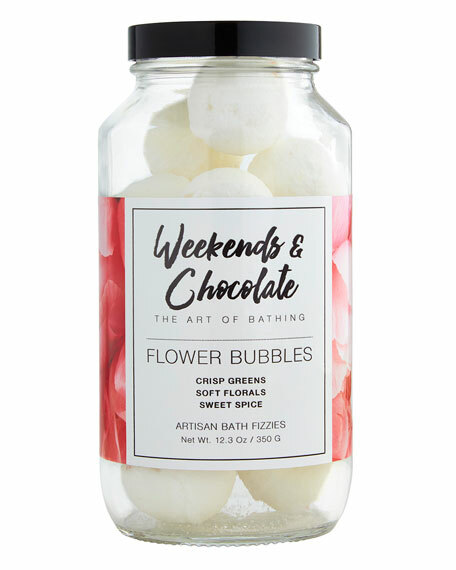 Weekends & Chocolate is a collection of natural, luxury spa products designed for the woman who believes in the power of a quiet moment—who knows that beauty is so much more than how we look.